Recently a number of truckers have been apprehended for toll violations amounting to thousands of dollars in unpaid tolls. Though this seems unbelievable to the average car driver, truckers are very aware of how expensive tolls are and how quickly toll costs for trucks exceed a thousand dollars, even in a single round trip journey. Using our new Toll Calculator for Trucks desktop application we identified the three most expensive toll routes in America. Below are the results assuming a 5-axle truck at 80,000 lbs weight and a minimum trip distance of 200 miles each way. Mile-for-mile, this is the most expensive trip you can make as a trucker, as you end up spending over $1 in tolls for every mile of your trip. 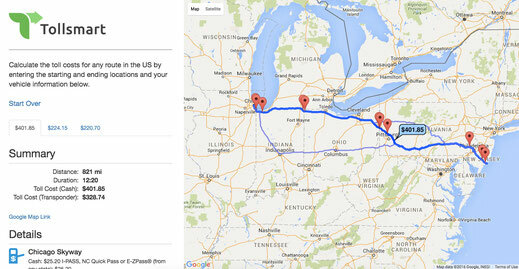 The total toll cost for this 210-mile trip is $248.60, equating to $1.18 per mile. Even with a transponder you'll still end up paying more than one dollar per mile, but at least you'll save yourself over $36 in tolls, not to mention the time waiting in cash toll lanes. There is an alternate route that is only $203 ($161 transponder rate) and it only adds another 9 minutes to the trip. You can check out the route using our new truck toll calculator. The second most expensive route you can take as a trucker is Chicago to New York City. Along this 826 mile route you can expect to pay a whopping $439.75 in tolls, so if you don't have a transponder you'd better bring a bid wad of cash! This route will cost truckers $0.53 per mile as it runs through the Chicago Skyway, the Illinois Tollway, the Indiana Toll Road, the Ohio and Pennsylvania Turnpikes and the Holland Tunnel (which alone costs $105). The good news is that there are a couple of alternative routes that will save you a great deal of money, including one that will also save you a half-hour of driving time. Check out this route using our new desktop toll calculator for trucks. The third most expensive truck route in the US is Chicago to Atlantic City, NJ, a distance of 821 miles at a total cost of $401.85 in tolls which equates to $0.49 per mile, leaving you little cash for gambling in the Atlantic City casinos. However there's an alternative route that will save you $177 in tolls and only add 16 minutes of driving time to your trip. Check it out here on our new truck toll calculator.